Notes: Dunham Hill station was situated on the Birkenhead, Lancashire & Cheshire Junction Railway’s (BLCJR) Warrington and Chester line which opened on 31 October 1850. The station opened as Dunham on 18 December 1850. It was located to the west of the small settlement of Dunham-on-the-Hill on the south side of Hob Lane which passed over the line on a bridge. The main station building was on the down platform (Warrington direction). Approached via a driveway the building was a weakly Gothic two-storey structure with steeply pitched roofs with and attractive bargeboards. On the up platform (Chester direction) there was a waiting shelter. Dunham was provided with a small goods yard, also on the down side, which was reached via the station forecourt. There were three sidings, two serving a cattle dock at the south end of the platform. The third siding, running diagonally across the yard, was probably for coal. A 3-ton capacity crane stood alongside this siding. A signal box stood on the up side opposite the entrance to the yard. 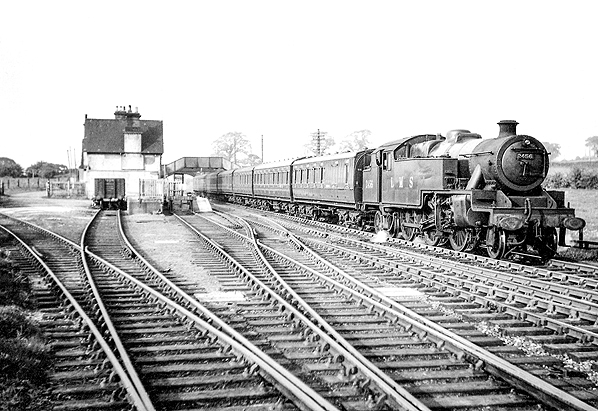 At the time of opening the station had services to Warrington and to Chester. On 1 August 1859 the BLCJR became the Birkenhead Railway, but the following year on 1 January 1860 it became a joint concern of the London North Western Railway (LNWR) and the Great Western Railway (GWR) known as the Birkenhead Joint Railway (BJR). The new owners renamed the station Dunham Hill in April 1861. The December 1895 timetable showed 7 up and 7 down services Monday-to-Saturday with 2 trains in each direction on Sundays. By July 1922 the service had reduced slightly to 7 up and 6 down trains Monday-to-Friday. There was one less up train on Saturdays and no trains on Sundays. Trains ran to Manchester Exchange. Liverpool Lime Street and Chester General. On 1 January 1923 the LNWR became part of the London Midland & Scottish Railway (LMS) who became the partner company in the BJR with the GWR from that date. At some point in the first half of the twentieth century Dunham Hill was provided with a footbridge which was located to the north-east of the station building. During the Second World War a rail-served Royal Ordnance Factory (ROF) storage depot was set up at Dunham-on-the-Hill. Construction of the depot, which had its junction with the BJR to the north-east of Dunham Hill station, began on 7 June 1941 and it was completed by 5 August 1941. The facility was first used on 11 August 1941. 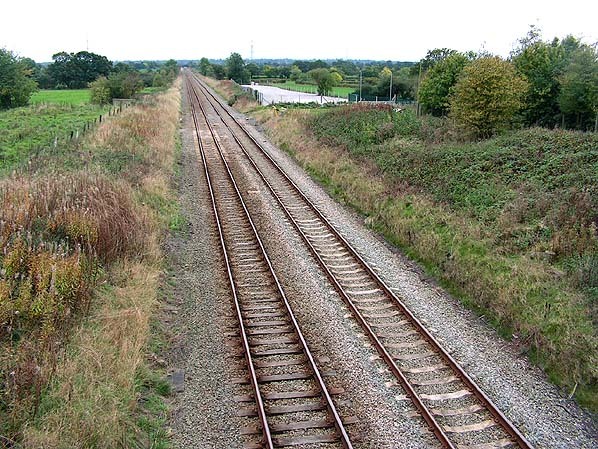 A number of sidings were located on the down side of the line to the north of Hob Lane. An LMS ARP design signal box, Dunham Hill No.2, was opened in August 1941 to control the junction and sidings. In 1942 an ARP design box was opened at the station slightly to the north of the original and it was called Dunham Hill No.1. During the war years Dunham Hill was very busy with munitions trains serving the ROF depot and the main line handled large volumes of through traffic. The LMS summer 1947 timetable showed 6 up and 10 down trains on Monday-to-Friday as shown in the table below. On Saturdays there were 8 up and 11 down services but no trains called on Sundays. Many more passenger services passed through the station without stopping. On 1 January 1948 Dunham Hill became part of British Railways (London Midland Region) (BR LMR). The summer timetable for 1949 showed only 4 up and 5 down trains Monday-to-Friday with a couple of extra services on Saturdays. Dunham Hill No.2 signal box was closed on 24 November 1951 by which date the ROF depot was being used by the Ministry of Agriculture. The box survived in a derelict condition until 2008. Being in a fairly isolated location BR (LMR) closed Dunham Hill station to passengers on 7 May 1952. 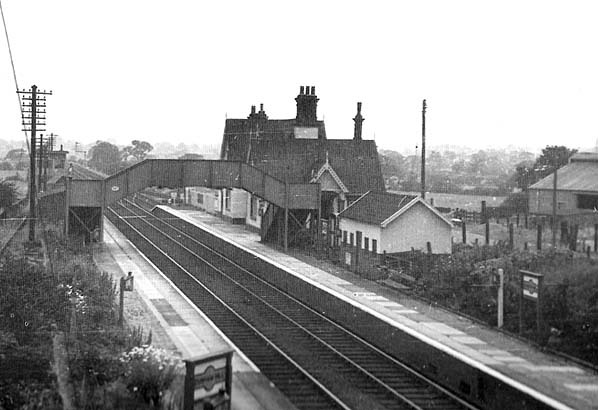 The station closed to goods on 7 May 1956. Dunham Hill No.1 signal box closed at the same time. The station buildings had been demolished by 1960 but the platforms survived until the early 1980s. The line was still a busy passenger and freight railway in 2014. Tickets from Michael Stewart route map by Alan Young. Dunham Hill station looking north-east in the 1930s. A 1:2,500 OS map from 1897 shows the layout of the station and goods yard. Access to the yard is through the station forecourt. Three sidings are seen two serving a cattle dock at the south end of the down platform. The signal box is seen opposite the entrance to the yard on the up side. 1963 1:2,500 OS. 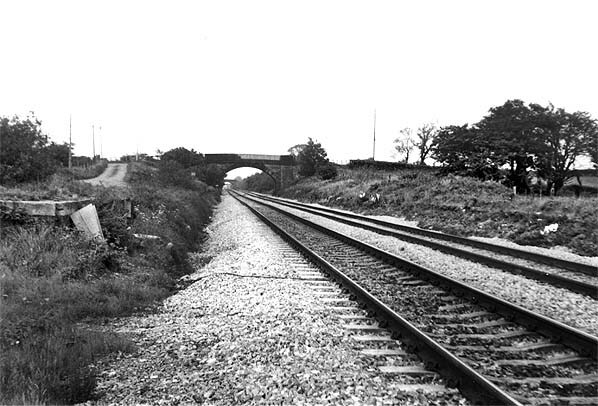 Although closed to goods traffic in 1956 the sidings were still there in 1963. The station buildings have been demolished by this date. Dunham Hill station looking south-west from Hob Lane bridge in 1949. 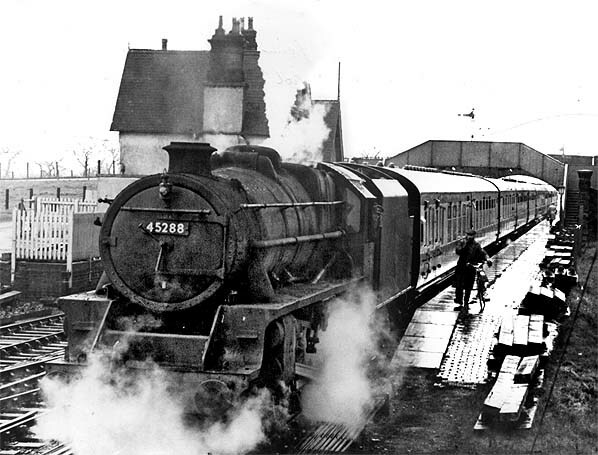 The 2:40pm Liverpool Lime Street to Llandudno train pauses at Dunham Hill station on 4 April 1952. 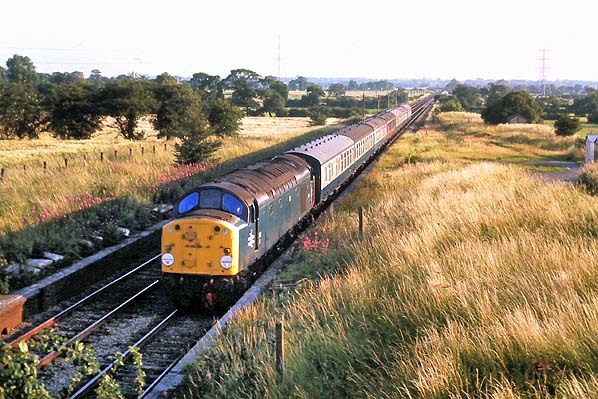 An unidentified Class 40 is seen at Dunham Hill station in July 1973 on a Holyhead to Manchester service. Note one maroon coach is present in the rake of mark 1 coaches. By June 1980 the remains of the platforms were very degraded as seen in this view looking north-east. The cattle dock is seen on the left. The site of Dunham Hill station looking south-west on 14 October 2005.